Ideal for classroom or independent study, this Revision Guide with ActiveBook is the smart choice for learners studying for the externally assessed units 1, 3, 5 and 7 of the new BTEC Nationals in Applied Science qualifications. 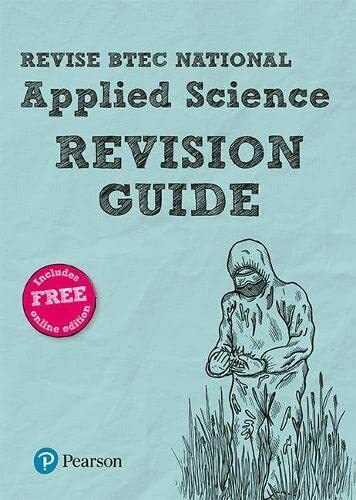 Exam Board: Pearson Edexcel Academic Level: BTEC National Subject: Applied Science First teaching: September 2016 First Exams: Summer 2017 The Revision Guide is accompanied by an ActiveBook (eBook) so that learners have the choice and flexibility to access materials anytime or anywhere. The visually engaging format breaks the content down into easily-digestible sections for students and provides hassle-free instant-access revision for learners. Clear specification fit, with revision activities and annotated sample responses for each unit to show students how to tackle the assessed tasks. Written with students in mind - in an informal voice that talks directly to them. Designed to be used alongside the Workbook with clear unit-by-unit correspondence to make it easy to use the books together.